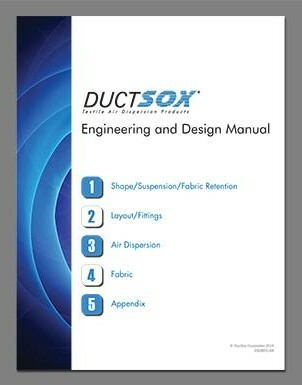 DuctSox have recently announced the release of their new fabric duct DuctSox Engineering and Design Manual. The revised manual follows the new methodology of designing a DuctSox System, beginning with selecting the Shape and Suspension/Retention system first. The manual also incorporates some of the newer DuctSox products and features, including SkeleCore and Nozzles. 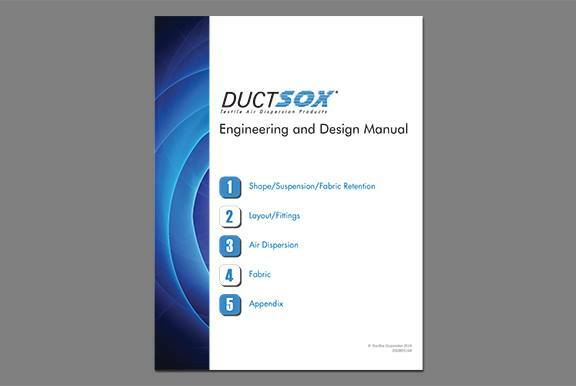 This design manual should assist through the design process for all DuctSox® Fabric Duct Ventilation Systems. The process involves considerations that include layout, sizing, air dispersion, appearance, durability and installation. • Series / Shape select shape for the application – Cylindrical or Surface Mount. • Design Layout determine duct layout and sizing – selecting DuctSox location, diameter, lengths and required fittings. • Fabric select fabric based on product quality, porosity, colors and/or required air dispersion type. • Air Dispersion determine type, location and size of vents for Comfort Flow, orifices for High Throw or calculate required porosity for Low-Throw Series using to supplied airflow and static pressure. • Suspension select Tension Cable, Suspended H-Track or Flush Mount Track for suspension. There is some general information included on Critical Environments and Underfloor Air Distribution. For design assistance on these products, please contact your nearest ecoHVAC representative. For more information on DuctSox Fabric Duct visit www.ecohvac.com.au. « ecoHVAC Facebook Page Reaches 400 Likes.